When you are looking for a versatile and roomy new ride for your family, see the 2019 Toyota Highlander, a mid-size crossover SUV that offers full-size space for up to eight occupants. With a smooth ride and three-row seating, the new Highlander proves that a family SUV can be highly refined! Packed with convenience and safety technologies, the lineup of 2019 Highlander models is sure to impress even the most tech-savvy members of your family! Power up the standard Entune™ Audio system and enjoy five USB ports for charging throughout the Highlander's spacious cabin. Toyota of The Shoals welcomes crossover and SUV shoppers from nearby Florence and Athens, Alabama to visit our dealership in Tuscumbia, AL or shop our website now. With our selection of new Toyota Highlander SUVs for sale at competitive prices and no dealer fees whatsoever, you and your family can enjoy a plush new ride at a friendly price! Thanks to its eight available trim levels, including fuel-sipping hybrid models, the 2019 Highlander mid-size crossover SUV can be tailored to your family's preferences. 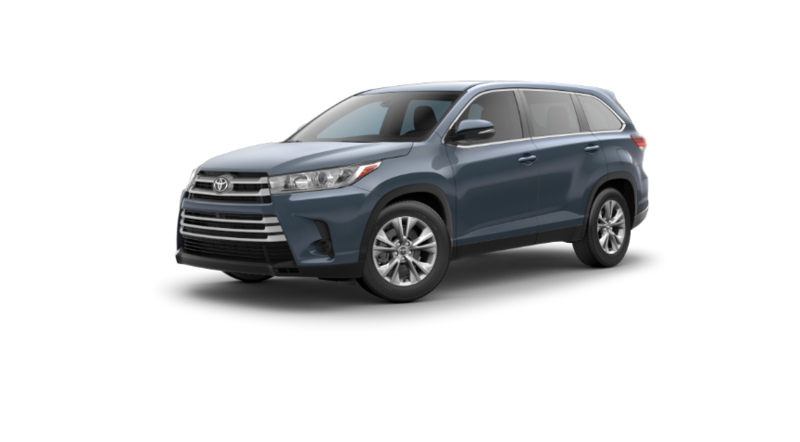 Opting for the Highlander LE base trim affords you a low price for a three-row SUV, along with Toyota Safety Sense™ P (TSS-P) features and 60/40 split second- and third-row seats. With heated and ventilated front-row seats, second-row captain's chairs and integrated navigation available, you can make your family's new Highlander as luxurious as you'd like -- all at an affordable Toyota price! Remember to turn to Toyota of The Shoals for all of your automotive needs near Decatur and Athens, AL. Our dealership is here to provide competitive lease and finance offers, professional auto maintenance and more, so don't hesitate to contact our team today.